Lately I’ve been painting my nails with normal polishes bcos’ I decided that I’m too lazy to spend 15 – 20 minutes removing my gel nails. The average “lifespan” of my nail design is around 4-5 days, so it would be stupid to spend extra time just removing them. I would change them even more frequently if I had the time…..
Left hand. I’m a rightie, so notice that my right nails are usually simpler than my left! 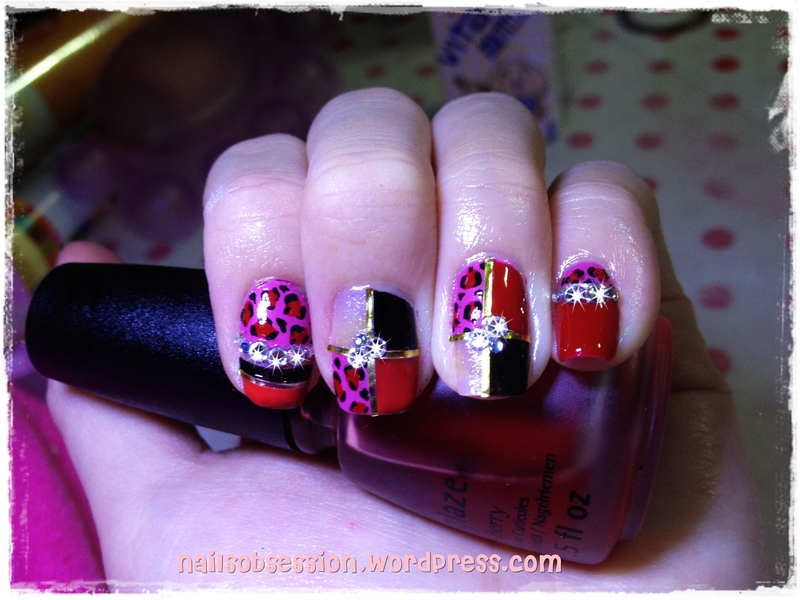 My nails 1 week ago: Easily removed my previous design as it was sealed with normal top coat. 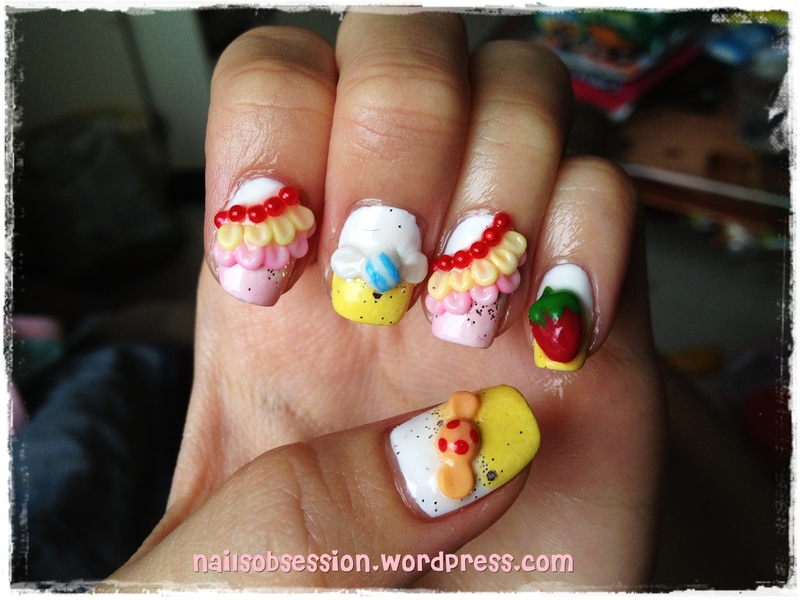 After my previous design I wanted to try something different, so I played around with this set of sweet nails – cake lace, candies and strawberry! After. Lace looks easier than picture, basically using the same technique for embossed flower I learnt in school! But candies and strawberry was kinda fail though, totally wrong proportionate zz. Design was sealed with gel coat and this art lasted all the way until I removed it 2 days ago! 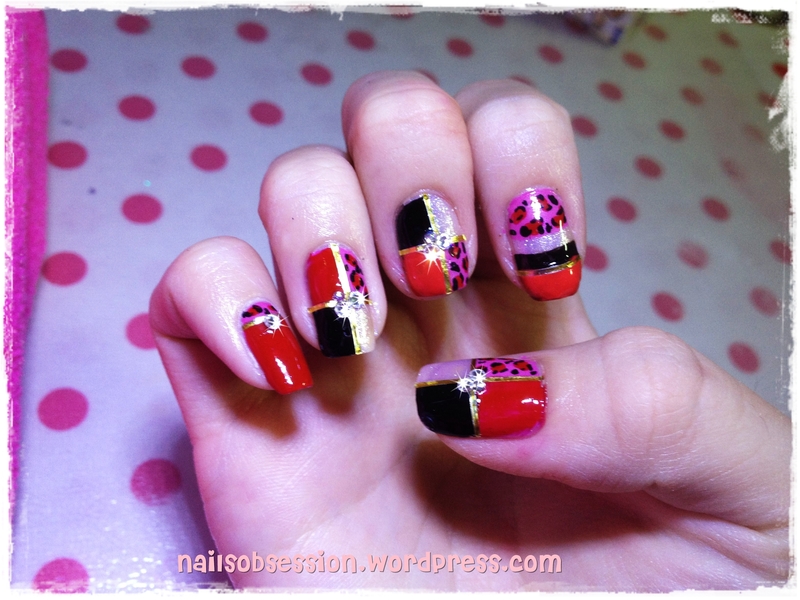 My nails now: Did this set of colour block leopard nails just 2 days ago! Had 2 weeks worth of embossed art so I changed to normal nail art. I finally got a chance to use my stripe stickers and I’m in love with it. I love how it completes the final look of this design (: Not an easy design to do as I had to consider which colour to paint on first, which portion to paint half or a quarter so that the light base is before the dark colours. In total I spent around 2hrs on this design! I painted the lightest colour first using OPI Princess Rule, followed by OPI Japanese Rose Garden, OPI Malaga Wine and China Glaze Jet Black. My right hand. 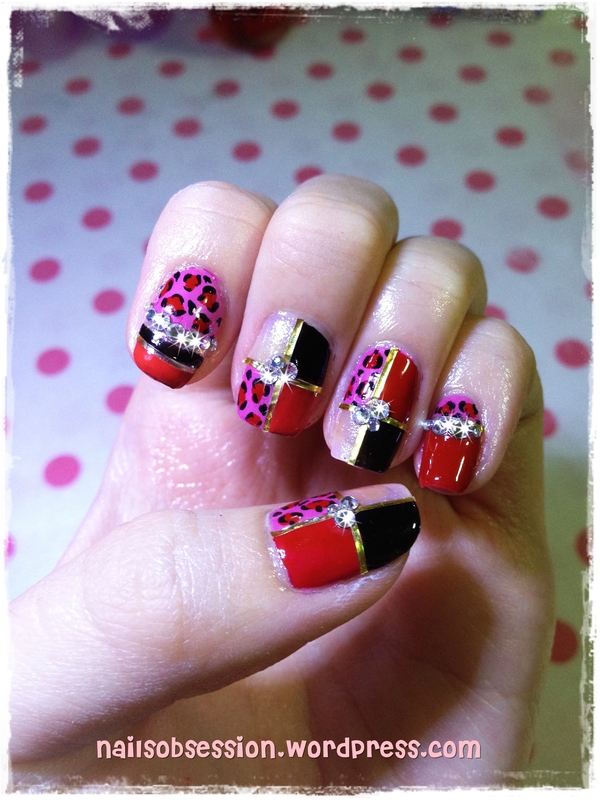 I always have a hard time doing my right nails zz, gotta need more practice! My toenails: Did them with AnGel Pro Gelly polish bcos’ I’m not planning to remove them until I feel like it. My last gel toenails lasted me for 2 months before I got irritated with the growth. LOL. P/S: Combined the posts together bcos’ I didn’t have enough time to blog.. Still in the midst of clearing my backlog. Give me a lil’ more time ladies!